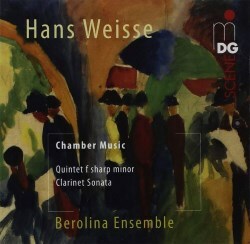 I imagine that for the majority of the people reading this review, as is the case for me, the name Hans Weisse is unknown; indeed, the opening line of the booklet notes describes him, in bold print, as “Hans Weisse – a neglected master composer of the 20th century”. I don’t know whether I would go that far, but there is certainly enough here to pique my interest in the composer and his music for me to hope that Dabringhaus und Grimm see their way to releasing more CDs, as a quick trawl online points to this being the only disc in the catalogues to feature his music. The notes state that Weisse, who was born in Vienna, is not mentioned in any musical reference book, including Grove or its German counterpart, Die Musik in Geschichte und Gegenwart. Indeed, a quick online search turns up very little information apart from his association with Heinrich Schenker, his teacher, and his role in the dissemination of Schenkerian analysis, especially in the United States. Weisse began studying music theory and composition with Schenker in 1908, his studies lasting, apart from a period of military service during the First World War, until 1919. Schenker’s approach was opposed to the “New German” of those supporters of Wagner,; instead, he built upon the principles present in the later and more progressive compositions of Brahms. The great man therefore became a beacon for Weisse, and his influence is clearly evident in the two works presented on this disc. Weisse had enjoyed a successful teaching career in Berlin since the early 1920’s and after a recommendation from his friend, Wilhelm Wurtwängler, he taught at the Schenker Institute in the city. This led to an invitation to teach for a year at the David Mannes Music School in New York, arriving there in 1931. He remained in America, becoming a highly successful teacher and died there in 1940, aged 48. Brahms’ influence is plain to hear in these two works. The Clarinet Sonata is more akin to Brahms’ E flat Major Clarinet Sonata than his First Sonata in the way that it, too, has only three movements. But this is not the only similarity; its overall structure is close to that of his idol, especially in the way that the slow movement is placed last. The first movement opens with a lilting tune on the clarinet underpinned by a rippling effect on the piano, which then takes up the tune while the clarinet plays fragments of it alongside the piano. The second movement is more animated than the first, with some nice thematic material which is developed more as a partnership between the instruments than in its predecessor. The third and final movement opens with a plaintive melody on the clarinet with a simple accompaniment by the piano, which, as in the first movement, is then reversed with the piano taking a bigger role. This is a nice work, one in which the clarinet, for the most part, stays in the middle and lower registers of the instrument. The Quintet for Clarinet and String Quartet is a lot more expansive than the Sonata with the opening movement living up to its description of being ‘Very passionate and rhythmic’, once again showing Brahms’ influence. However, this is less overt in the Quintet, as can be heard in the structure of the work. The second movement is ‘Very lively (in a scurrying motion)’, compared to Brahms, who put his Adagio second. There are also stylistic differences, with the writing for the stings at times resembling the plucked strings of the Ravel Quartet. The third movement is marked Sehr ausdrucksvoll, doch nicht schleppend, ‘Very expressive, but not sluggish’; it has some wonderful writing for the strings and is in many ways even more impressionistic and characteristic of French music of the period than the second movement. The final movement lives up to its billing of being ‘Lively, with a good mood’, and once again there is some lovely interplay between the clarinet and quartet. This is a wonderful find, which at 43 minutes does not outstay its welcome. The Berolina Ensemble are used to exploring the musical byways and are excellent throughout; the clarinettist, Friederike Roth, has a clean, tender tone throughout, even in the Quintet, where her rage increases. She is more than ably backed up by the other members of the Ensemble. The recorded sound on this hybrid SACD is, as one might expect, excellent, and well up to MDG’s usual standard, as are the booklet notes, which concentrate on introducing the man more than the music. So, is Weisse “a neglected master composer of the 20th century”? Well, on the evidence of a single disc it is difficult for me to make such a sweeping statement, but on this evidence he is certainly interesting and unjustly neglected. Let us hope that MDG and the members of the Berolina Ensemble go on to introduce us to more of his music so, that a more conclusive analysis may be drawn.